Can a Poet Be a Badass? Absolutely. Yes. 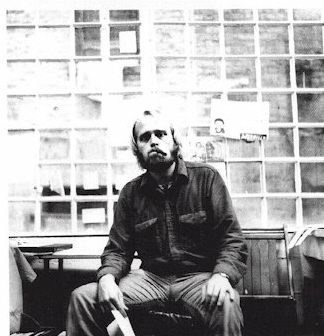 I like this photo of Ron Silliman, albeit a younger version of the poet, because it reflects his inner badass-ed-ness. Hesitantly, I met him yesterday to do an interview for MiPo Radio. “Hesitant” because I was fairly intimidated and feeling highly underqualified. Call this kissing up if you must, but I often read the man’s blog and feel like he’s right on about a number of subjects. And coincidentally this morning, I got to witness a minor Silliman smearing on a poetry listserv, by people who might be characterized as (like the young folk say) “haters.” This kind of indiscriminate hating pretty much verges on the ad hominem side of “critique,” and I think, comes from resenting that Silliman has things to say that we wish we had articulated first. Silliman is very good at putting pieces together and creating something of a bigger picture, whether it be about politics or poetry, that gives us a kind of mapped understanding of things, something we sorely need when arguing with the right. Anyway, I think Silliman is forthcoming on a number of topics, and dare I say, he even verges on the scintillating. Stay tuned for the Silliman podcast. And for my fellow music fans, there’s so much on the horizon suddenly, I can’t begin to count. Wilco is pleasing die-hard fans across the country with this new live concert release, “Kicking Television: Live in Chicago.” Fan or not, it’s worth your extra beer money, every penny, if only for the lush re-presentation of songs in a whole new leopard skin pattern. Modest Mouse and Sun Kil Moon followers are in for a special treat: Sun Kil Moon has finally released a new one, and this part isn’t really advertised, but it’s a new one that covers Modest Mouse tunes. Look at the song titles alone and you’ll know the truth if you’re in the proper school of thought. I will admit that I just got it last night, so I haven’t listened (but I will update you later). But it’s just the idea of it: Sun Kil Moon does Modest Mouse? Modest Mouse in slow motion? I’m totally titillated by the idea of Tiny Cities. I also have a new cd that I’ll post about later … it’s produced by the same label who does Modest Mouse and is supposed to be hot. Along with the Silliman interview, I say, Wait for it. p.s. How could I omit this delicate matter?! My favorite coffee house, Gimme Coffee, is up for Best Coffeehouse in NYC. If you’ve ever loved me (or their coffee), you’ll go there now and put them over the top! This entry was posted on Sunday, November 20th, 2005 at 4:59 pm	and is filed under Poetry, Music. You can follow any responses to this entry through the RSS 2.0 feed. You can leave a response, or trackback from your own site. Edit this entry. Well, one of the things I appreciate about Silliman is that his opinions are his own, not fashioned to impress anyone else (especially his detractors). He has a point of view and some of us are interested in it even if we don’t always align with him…absolute reaction (if he likes it, I’m ag’inst it) is no critique in my book. November 20th, 2005 at 5:51 pm eThe Wilco album is amazing, esp. Spiders (Kidsmoke). The cover of ‘Ocean Breathes Salty’ is oh so good, as well. November 21st, 2005 at 3:56 am eP.S. I voted for Gimme Coffee! but it was close. I live two blocks from there, but work around the corner from Joes. Gimme Coffee! does have the better coffee, but not the cute baristas who flirt with me. Tough choice. got married for christ’s sake! November 23rd, 2005 at 11:42 pm eI keep trying to ‘member Kev! But you moved to Buffalo and froze and now it’s hard to feel your heat. When am I coming up there??? November 24th, 2005 at 7:15 am eI look forward to the Silliman interview podcast. And I love Wilco. I’ll check out the live album. Thanks.